Not necessarily what you want to hear! It's always very nice... and reassuring to have a second opinion. Finding an agent is a very funny business. Well, you have to laugh to keep your spirits up and maintain a healthy perspective on life. Today, my YA novel, The Reaping, was rejected for the second time by the same literary agency, but by a different agent within, both of them very nice and polite. Not my mistake! I hadn't chanced my arm and tried two agents in the firm, hoping they wouldn't talk to each other. It was their mistake. Overloaded with submissions, mine clearly surfaced twice like a drowning man before he sinks altogether. I submitted the synopsis on 17 November 2014. It was first rejected five months later in March 2015. Over a year later - today, 22 December 2015 - it was rejected again. I pointed out the error in a cheerful email, which was received with equal good heart. No one has been hurt, just a little time wasted. What have I learned? Submitting has a funny side. Agents eventually read everything, sometimes twice! Diggle’s Dilemma: to write or market? Increasingly, I don’t think I can do both. Find an agent you say? I know that is a good idea… in theory… but let’s not be diverted by that question. 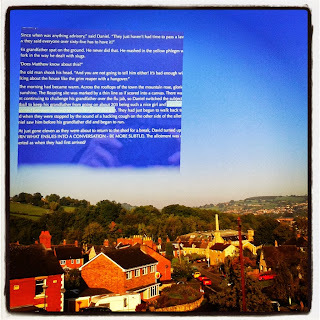 In the past four years I have written four novels for children/young people. I am presently re-writing the second one of these. The other free remain in finished form, but have proved to be unplaceable to date. I think that they are there or thereabouts, certainly interesting, one amusing and another uncomfortable and challenging, verging on the adult. That is Diggle’s Dilemma. Do I concentrated on finding a home for three or crack on re-writing the second one I started… or start something completely new? Unfortunately, I am a finisher, tenacious by nature and nurture. Why the dilemma? Time and energy. I’d rather be a writer than a marketing man. Today, you have to be both. Should I spend time putting my work in order or crack on with the new, even make a change of direction – write for adults – NOW!? I think I may have said before that curation might be the answer. Just put my work up on the web and see how it goes. That seems like a half-way house and doesn’t really resolve anything. Time will tell, but I can no longer sit here doing nothing. One must dismount with purpose rather than just wait to fall off the horns of a dilemma. Big things - waiting for my father's funeral. He was 90, a D-Day naval veteran at 20. I am an orphan at 62. That's a lucky life. Small things: I have plenty of inspiration - I know what I have to do. For the time being, I am enjoying the warm April sunshine. It's two months since I've blogged. Meanwhile I have been to Alberta, Canada for a month over Christmas. I have done no writing since finishing The Reaping, but have been collecting my thoughts. On my return from Canada I went down with a debilitating cough - transatlantic air travel - but I am better now. I have shovelled out my my study and reoriented my desk at right angles to the window. New beginnings. Ha! Agents? I have heard from 11 out of 21. Ten pro-forma negatives and one more personal, but still a negative reply. I am beginning to think I am uncategorizable in that I don't write genre fiction, I flit between age groups, and am not intent on producing a series or recognisable brand. I write about what interests me. No complaints. I write well enough. Some might say unprofessional. Ha! In the past four years I have written four novels for children & young people, a total of a quarter of a million words, more if you include all the redrafting. Three of these I sent off to agents, unsuccessfully, one I didn't feel was ready. Rework the four novels I have written? The stories are worth telling. Develop two of the above into a series? Settle on writing for 9-12's? Begin a new children's novel? I have two ideas. I still have some thinking time. I tend to think it will be a year of consolidation, travel in the camper van, and then come October the beginning of a new story. Self-publication is still a maybe. Becoming the next big K-ching! Sometimes when you throw a ball against a wall it will bounce right back up and hit you under the nose before you've had time to settle your stance. It stings! Game spoiled, temporarily. That's how it was with my second submission of The Reaping to an agent. Outbox on the 13th November, back with a clout to my inbox on the 17th. The positive: agents work weekends. The negative: my proposal failed to entice. I probably had 30 seconds to impress - same with buying houses - speed dating in the dark. 50 submissions to consider. Despite being a published author, I warranted a mechanical rejection. That's the way it is. Next! K-ching! I have a further nine submissions out there at the moment and more to follow. I like to hear back, but I also enjoy the deluded interlude where you imagine anything can happen! 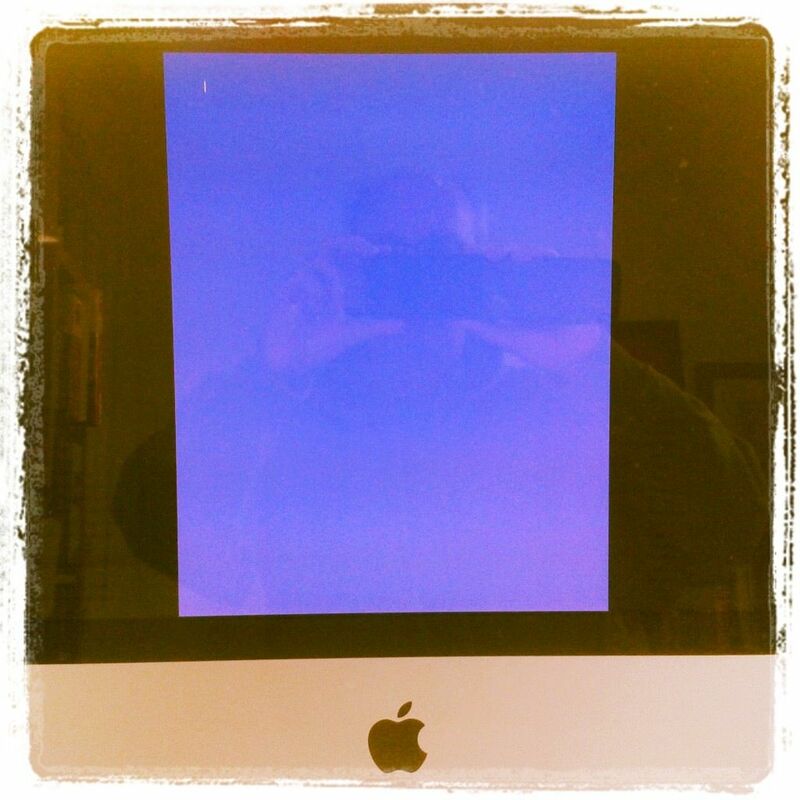 I have had a brief Twitter exchange with Ed James ( @EdJamesAuthor ) about self-publishing. He has worked hard and been very successful at it, but it may be more difficult to successfully self-publish children's/YA fiction. I am not complaining. I shall give it some consideration in 2015. I re-drafted the synopsis of The Reaping and it still remains at around 1,200 words, which is better than the 3,000 it became at one point. Who knows whether it is any good? I've kind of lost the plot with the exercise, which is not great when when you are trying to impress someone about your ability to tell a story. I have now sent off my proposal to five agents, electronically. I am working on the basis of tackling one submission a day. Each agency wants the same sort of thing, but in a slightly different form. Attention to detail is all, requiring the same concentration as a CV or job application. It is not a job to be rushed or for the faint-hearted. 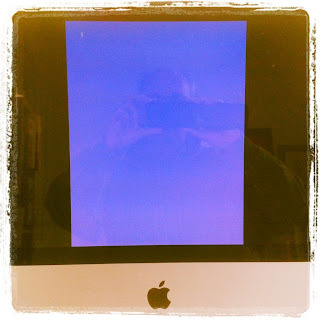 The screen is a duplicitous thing. It colludes with your eyes against your best attempts to spell and punctuate, to put each word in the correct order or to put them in at all. Press SEND and be damned... one hopes not. I am philosophical, not excited. Pleased to be finished... for now. I am happily ahead of schedule! I finished the final draft of my YA novel, The Reaping on the 3rd November, although every time I read a page on the Kindle I am tempted to change a word here or there and make adjustments to the manuscript in Scrivener. I must draw the line. I have ended up with 70,100 words, a hundred more than my target. I am not feeling euphoric. Any rapture at finishing has been tempered by the grim task of producing a synopsis to tempt an agent. I spent four hours yesterday producing a chapter by chapter digest; I gave up at the halfway point through the novel. The synopsis had already crept up to 2000 words and it was so dry that it made me soporific just checking the spelling. Hopeless. I abandoned it! This morning I produced an elegant spidergram of characters, relationships, plot points and themes in Scapple. The chart means a lot to me, but would baffle and annoy an agent. It proved to be a useful aid, leading to the first draft of a 1200 word synopsis, which contains most of what I want to say about the plot etc. Tomorrow I must précis it and give it a little pizzazz. I'd love it to become 850 words, but I don't hold out too much hope. As long as it sings on the page I shall be happy! After that I must write the letter: So may I introduce to you... if only I was Sgt. Pepper's Lonely Hearts Club Band! I am little behind schedule, which is most unlike me. That's not a bad thing though; I have been taking my time to get The Reaping right. When I last blogged it was June. I worked through most of the summer. As autumn arrives I have just completed the 5th draft, five minutes ago in fact. No euphoria yet; I have exported my MS from Scrivener in Kindle format, so I can see how it looks from the ereader's point of view. Reviewing it it will mean more note-taking and hopefully only fine tuning of the text. I thought that was what I was going to be doing in this last draft, but I ended up cutting out whole scenes which had slowed the pace of the story and rewriting others. Am I pleased? I am not sure. The last of the September sunshine beckons. I have not been birding in an age. I shall go to Slimbridge on Friday afternoon, a reward for sitting here and sweating it out between now and then. That is the only way to do it. I shall not finish this project prematurely. My news deadline is the beginning of December. Nine weeks is not much time. This is where I'm at! I have completed the 2nd draft of The Reaping and read the whole thing again. In my head I have sent it off to an editor. Euphoria. It is useful to role-play the situation and I have been on the receiving end of tough love about a book before. And now in my head, the book has been returned and the comments are more devastating than I thought. Misery. Kick the wall. Throw a bottle out of the window and hope it hasn't hurt anyone as it shatters. Regret. Go for a long walk. Have a drink. The first half of the book works, the second half does not quite so well. I have written myself a stiff and unambiguous note about the problem areas. Time to set another deadline. 2nd draft was due 1st July - I managed that. The next? I haven't decided yet. Summer beckons. I have to get this book right. I know I shall. It's just going to take a little longer than I thought. There is absolutely no point sending it to an agent before it is ready. I am more than halfway there, but there are some big issues to resolve. I may change the narrative voice. I may not. That is the whole point of a third draft. Some huge decisions to be made. I have not posted anything on the blog for a while, simply because I have been working on revisions to my manuscript, currently standing at 61k words. 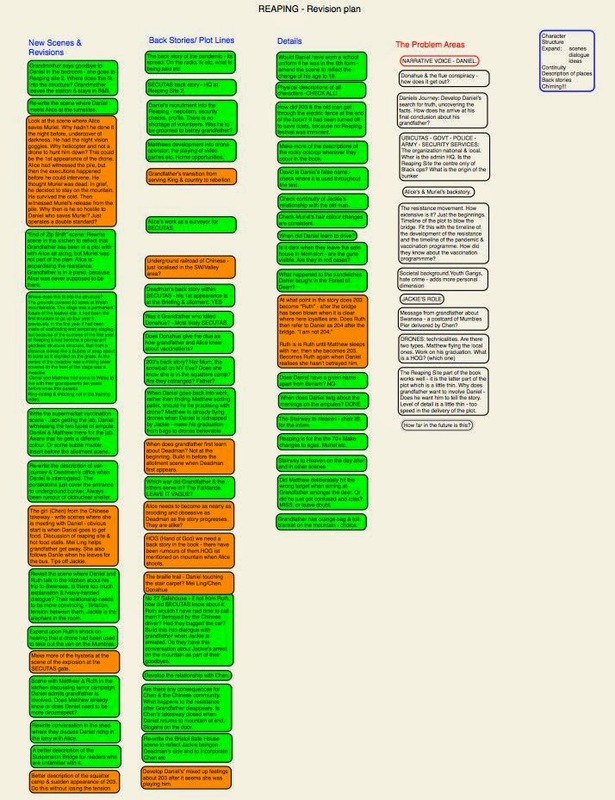 I have used Scapple to develop a revisions map, and as you can see I am working through it (whilst listening to piano music) and RAG (Red Amber Green) rating my progress. I started with small details that could easily be changed, but have now moved on to writing new scenes and revising others. Then I shall play around with the structure of the story. Finally I shall look at fleshing out some of the character descriptions (physical) before I re-read the whole thing and begin polishing the text. Reaping the rewards of hard work. 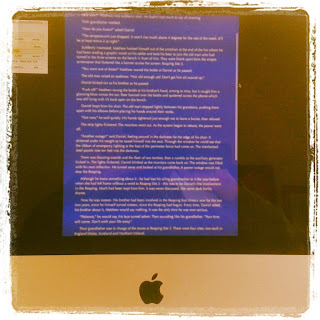 Still ahead of schedule, I have begun my revisions of my YA novel, working title, The Reaping. I have read the whole thing through, looking at structure and continuity, but also picking up irritating typos along the way. I now have a list of scenes I need to add and develop, and descriptions I need to check to make sure I have been consistent throughout. When I have done that, any scenes I need to delete will probably become apparent. Once the structure is in place, I shall return to character. I certainly need to add one and flesh out the others, then I shall turn my attention to place and atmosphere, not that the book is just sitting there in skeletal form like a boat waiting for planking and fittings. Am I optimistic? I always am at this stage. Or am I on a fool's errand? I am confident that I am not. My basic premise works. It now has to become something that is real. Unforgettable. How long will it take? Well, I am in Italy next week. I guess I shall be finished completely, by the end of June. But I have some travelling to do in between. A little euphoria goes a long way. It's a happy day when you finish the first draft of a book, and hopefully an auspicious one when you complete it on 1 March with the sun shining and Spring in the air. It is the same feeling as you get when you finish your Finals at University. Job done.... for now! Ahead lies some stolen and golden time, before the reality intrudes. A holiday! Time off! Release. Not that it has been unbearable. I have enjoyed working on the project more than I have on any other one. Not that I am complacent. I am looking forward to the redrafting and making this story work. At the moment I don't give a damn about trying to sell it. I just want the story to be good. The writing of a synopsis, my pitch and emails can wait. Right now I am inclined to forget that reality and just enjoy the moment. It is always good to have an idea in hand though, just in case, and I have many. The road to being published again is an uncertain one, but their are many good views to be had and people to meet along the way. There'll always be something to work on. But right now, I'm going birding, I'm going to take a few days off. Start again with a clear head. 3000 words to go until I finish the first draft of The Reaping. Another thousand words tomorrow, then a five day break. I should be finished by the end of next week. Pleasingly, I shall be well inside my schedule. I shall then take a break and begin working on the second draft at the beginning of the second week in April and hope to complete the final draft by the beginning of September. The book will have taken 12 months. 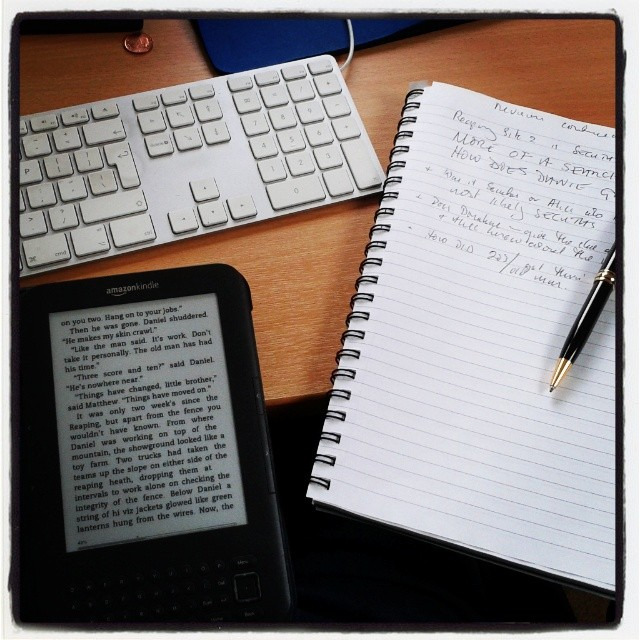 Time goes quickly when you are writing a book, although paradoxically the process seems slow. Deadlines come around faster than Christmas. So far, so good. Meanwhile, the world turns as normal. 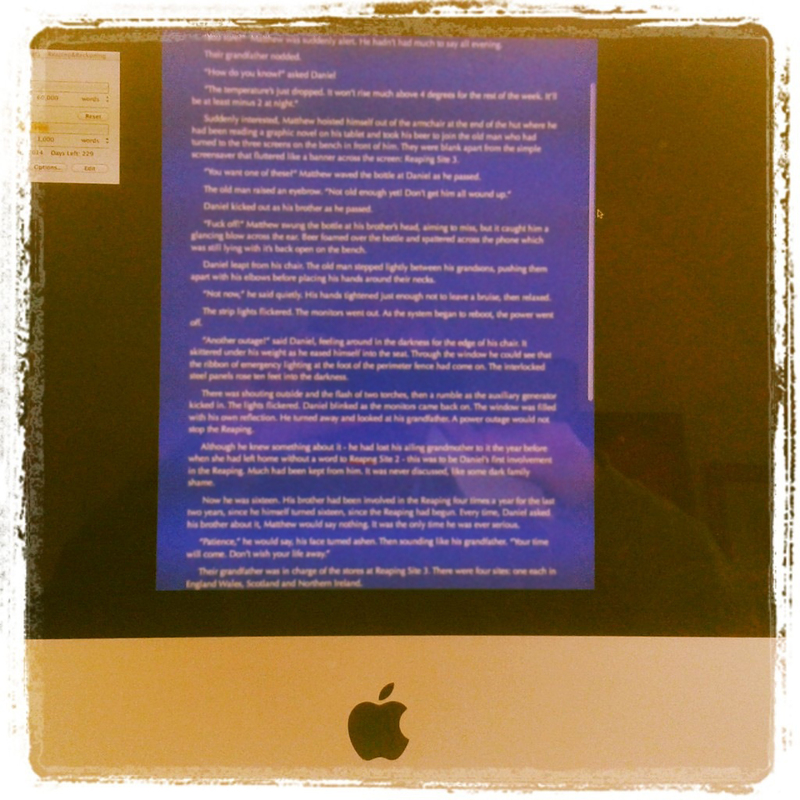 55 days to go to my deadline for finishing the first draft of my YA/crossover novel. 11,231 words remaining to complete the 60K. 11 working days. Sounds like plenty of time. How's it going? I am approaching the final scenes. I have been writing in chronological order, working out the story as I go (my usual working method) and making notes for changes, using Scrivener's Document Notes along the way. I am optimistic, but the book will require extensive rewriting. It has taken this long (I began mid-August 2013) to discover relationships and motivations. I have been sketching. I need to layer some colour & texture, bring light and shade to the piece. You know what happens to lines drawn in the sand. Deadlines. Important, particularly when self-imposed. I have 82 days left to finish the first draft of my current project. (YA/cross-over). I am back into it today, back to writing a 1000 words after three+ weeks off over Christmas. I have accumulated 42,084 words to date out of 60,000. I hadn't realised so much time had slipped by while I was enjoying the season of good will and good intentions. Think how much I could have achieved in those few weeks? I could be 5,000 words, 5 days from finishing. Now 82 days doesn't sound very long, especially when you knock out the weekends. It is 9 January 2014 and this is my first attempt to practise my New Year's resolution to write the blog more often; after all that is why I have bought a wireless keyboard for my iPad. (That is my story and I'm sticking to it). I thought if I wrote the blog downstairs and did some social networking in the evenings at the dining room table (whilst being sociable) I might keep that side of things current. Hmm. I'll make a start on that on Monday night; after all tomorrow is Friday. So which blue sky to choose? This is Diggle's Dilemma. A clear blue sky is so rare in autumn in my part of the Northern Hemisphere, it is tempting to just shelve the writing and spend time outside. The alternative is to pull the blind and just get on with it. But then when lunchtime comes and the sky has clouded over - particularly if the work has not gone well - there is regret to be dealt with. Now it is 12.30 p.m. & cloudy. But I did go out for a coffee. No regrets. 735 words to write this afternoon. I am in that happy place - 20% into the first draft of a new book, which in this case translates to about thirteen thousand words - telling a tale to myself, finding out who inhabits it already and who else is to be met along the way. This is just as well, because of the ten agents to whom I have sent The Tall Story of Tiberius Small, seven have said no, albeit one was a near miss. I have three left in the mix, before I have to start thinking about buying a monochrome laser printer and sending out submissions on paper to the diminishing number of agents who still accept such things. An inkjet just won't cut it as far as printing text is concerned. I look forward to the time when all agents accept electronic submissions only. Writing is the only remedy for rejection. Self-publishing doesn't quite do the trick. It is an aspirin; not quite as good as meditation as a way of clearing the head. And that's what writing is, when it is going well: a meditative state. It's only when the self-editing begins, that stresses come into play as you wrestle with the nuts and bolts of the construction that is creaking and wobbling and tilting in front of you. So life is good. The story, the discovery of it and the writing remains the thing. Blue! The best and worst of colours. Probably the most terrifying, but enticing expanse of blue a writer will ever look at. 8.30 a.m. I am about to write the first words of the first sentence on the first page of the first chapter of a new novel. 8.35 a.m. I look at all my favourite web pages and vow not to look at Twitter while I'm writing. 9.00 a.m. I am still taking furtive glances at Twitter. 9.10 a.m. I promise myself I shall not reply to any Tweets today. 9.25 a.m. I have replied to a Tweet. 10.00 a.m. My screen is still blank. I look at my notes on Scapple. 10.15 a.m. I make coffee and bring it upstairs with two slices of toast to my study. 10.20 a.m. I set Project Targets in the Scrivener drop down menu. Deadline for finishing: 1 April 2014. 10.45 a.m. I begin writing. 13.45 p.m. I begin again. Tomorrow is another day. 59,000 words to go. I fancy April 2014 is nearer than I think. Age & the wings of migration. The changing of the seasons. I know that autumn is rolling around, because I have started writing a new book today. That is my routine; a kind of migration. Summer and Spring in one space, and the rest of the year in another. I have begun a cross-over novel, which I think means a Young Adult novel (YA), which can be read by adults. Or maybe it is New Adult novel, (NA) that new category for 18-25 year olds about rights of passage. I don't really care about categorisation. Perhaps I am writing a novel for adults which can be equally ready by 14 year olds. It comes down to telling the story in the best way possible. The end result must be spectacular, better than anything I have written before. I am committed to upping my game for this one. That's how a writer should feel on starting out on a new project. But it is more pertinent than ever, as the publishing business has got so tight. I am sixty years old. In this up and coming book age is no barrier. 'I thought you were dead...,' he said. A way back a child expressed surprise on seeing me. "I thought you were dead," he said. "Why did you think that?" I asked. "Because all authors are dead," he said. Certainly not dead, but I have been out of print for a while, obtainable only through Abe Books or Amazon, sourcing my novels from secondhand dealers in Australia, Japan, the UK or wherever my books have ended up. They have been thinly spread across the globe; a small miracle in itself. But now? 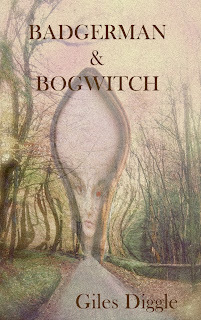 Badgerman & Bogwitch has a wider distribution. Having wrestled with the old WordPerfect files until I put it back in shape, I uploaded it to Amazon today as an ebook. I am left with one question? How long will this book be in eprint? It could be 1000 years. No one seems to know the answer. I am not inclined to delete it. Nothing in my writing is ever planned. I play around (or work around) until things look right. An ability to recognise shape, patterns and shadows is the the thing. That is where I am intuitive rather than applying rules. I don't plan. I write, then unpick, delete and shuffle what is left. Then add a little more. Sometimes I have a blind spot. Quite often actually, which is why it is good to let a first draft settle for a long while. The glare of the final sentence blots out the flaws in the four thousand sentences that have come before. So what was so wrong with the first draft I finished a year ago? It started out as Young Adult (YA) fantasy set in the real world, avoiding as many angst ridden vampire, zombie, dystopian love threads as possible. The story had edge that would cut the skin, if not the carotid artery. But with the story came an ending and a logic that said it was more suited to a younger age group. Maybe I am unskilled in the art of YA or just unwilling to twist the knife? So fluently reading 10+ it is, with a closing parameter of 14. Not that I really believe that stories can be targeted accurately at age. That has more to do with signposting & marketing. When my sight returned, I noticed two things that should have been obvious from the outset had I planned, but then writing is the way I construct something. It is a laborious and frustrating way of doing things, but never boring. I recognised a minor character, who by a different name I had written about before in Badgerman & Bogwitch. The second thing of course was the landscape. Much as I had tried to make it different, it was still the Ramswold Valley. I should have recognised the landmarks. At last the shape is there with the missing pieces and the things I need to change. I have 52,000 words to unpick and rearrange. I know the world of the Ramswold Valley so I should not resist writing about it if there is more to say, another story in its own right. To help me I shall use what is really a free-form and intuitive planning tool, Scapple, from Literature & Latte. Instead of planning I am using it to unpick and rearrange and add to what I already have. And it is cheap too at a few pence over ten quid. 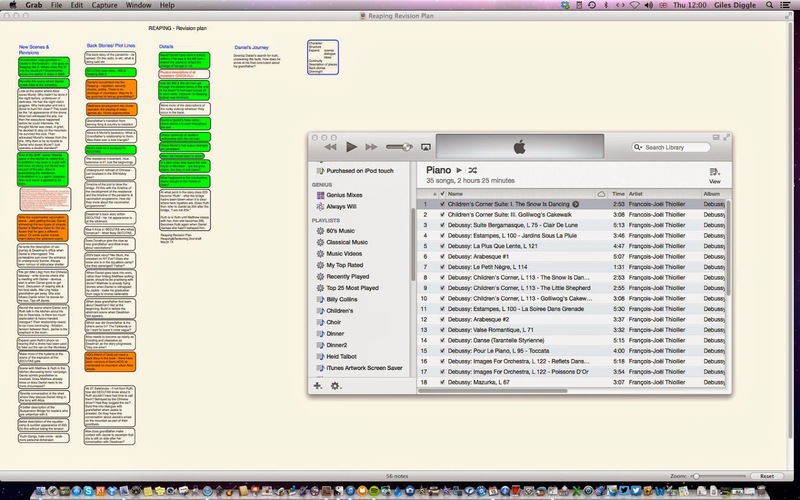 I already write using Scrivener, so it is a natural process to use. This is my work for the summer.